Adorable earrings, gave them as a baby shower gift to my best friend and she absolutely loved them. P.S. The packaging is adorable, very Tiffany like. Exactly what I was looking for. Perfect for my 7 month grand daughter. A dear family friend wanted me to locate a piece of jewelry for a welcome to the world little one gift and what could be better than little hearts. The screw backs and shorter posts make them perfect for little ears. Perfect for day to day use. Plus, every little girl needs 14k gold heart earrings... these are great!! This earrings are simple but pretty and beautiful! My granddaughter just turned two and she has pierced ears. I ordered a pair of 14 k gold earrings from Tiny Blessings jewelry for her birthday. I was amazed how beautiful and well made they are and also the box they came in. Excellent quality! 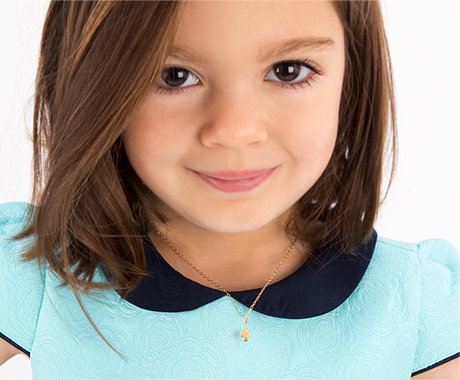 Recommend this company if you are looking to purchase jewelry for children and teens. I can't say enough about the earrings I purchased, beautiful. Very cute and really nice packaging! These earrings are exactly like the picture: adorable looking. I can't wait to give them to my tiny niece. I am also very grateful for the packaging. Perfection! Thank you! !